Tebow Super Bowl Ad – What is the Big Deal? The most highly anticipated Super Bowl ad prior to the big game was the Focus on the Family clip that included Heisman Trophy winner Tim Tebow and his mom. For weeks, all the talk has been that this is a Pro-Life ad and that CBS is negligent in allowing the ad to run. Now that the ad has run, I really don’t see the problem. My wife and I looked at each other last night and almost in unison said, “What’s the big deal?” You can judge for yourself. Planned Parenthood decided to create their own ad with a couple of athletes. I have no idea if they actually saw the ad (Tebow ad) before it aired, but their ad seems a little out of sorts, in my opinion, but everyone has the opportunity to create their own ad and post it on Youtube. If Planned Parenthood really wanted to diminish the value of the ad they would have just let it run. By focusing attention on the ad they guaranteed that millions would be sure to watch it, just to see what all the hubbub was about. I would say that Focus on the Family really got their money’s worth in advance publicity and continued exposure of the ad on Youtube with over 120,000 hits since yesterday. Gloria Allred will also push the ad to epic status. I’m not sure that was what she was going for, but it’s all publicity for her. 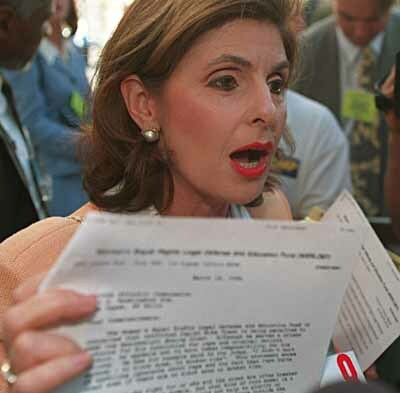 Allred is threatening to file a complaint with the FTC and the FCC if the ad airs without disclosing that abortions were illegal in the Philippines at the time Pam Tebow made her choice. She is making a huge mistake attacking a woman for making statements that Allred can’t possibly disprove. And she’s revealing herself to be anti-choice in deciding that Pam Tebow’s choice isn’t worth hearing. I for one am all for ads just like this one that are tastefully done. No where in the ad was there some call to action or chiding others for having abortions. CBS has discretion to accept or reject whatever ad they choose. They are a somewhat left leaning network in their news division but the marketing people obviously know the makeup of the country and decided to let this ad run. By rejecting an ad from a gay dating site they also revealed that they knew this would cause problems. I’d say they made a smart business decision but we’ll see when the ratings come in. Again, you just have to love Steven Crowder. He has a great way of presenting relevant topics in an easy to understand format. This week it’s Embryonic Stem Cells! Now I don’t consider myself an expert on stem cells – adult or embryonic – but I am pro-life (hey, there’s a shock!). Sure there are embryos that will not be used in fertility clinics and we can argue the viability of destroying them or using them for science. OK, let’s say that we could use these embryos that will be “discarded” anyway. What happens after that supply runs out? Where will the researchers get the specimens? There could be a time where these are actually harvested from women much like a crop in the field. Of course, this is pure speculation on my part or maybe the plot line of some sci-fi movie I caught late one night. Contrary to popular belief, President Bush did not outlaw research on Embryonic stem cells, but he did outlaw the harvesting of new embryos for the purpose of research. This seemed reasonable to me as a starting point. What have the researchers gained from the availability of the Embryonic stem cells? Maybe one of our readers can help me out with that one. President Obama recently recinded this 2001 policy so it’s full steam ahead! On the other hand, there have been many advances with the Adult Stem Cells. The research is busting out all over and making incredible advances. This begs the question…why are we spending so much valuable time and money on an unproven theory of the holy grail of embryonic stem cells when the adult stems cells present such promise? I can’t answer that question, but I’m sure Planned Parenthood has some stake in the policy. I love liberal journalists. I really do, honestly. Paul Krugman, a columnist for the New York Times, wrote a column on the Op-Ed page on June 11 called The Big Hate. Sounds provocative, huh. All I can say is at least this type of opinion was on the Op-Ed page and not on Page one where it usually ends up. You are more than welcome to read the whole ugly article, but I’ll pick out the most interesting points, to me, and offer up my opinion. First off, George Tiller was a baby killer. There really is no other way to express that fact. He did have blood on his hands. The guy that killed Dr. Tiller was a nut job. Nothing that Bill O’Reilly said on his program was news to this guy or any other right thinking person. Strike 1. From what I have read and heard, this incident (FEMA) did not happen. Shine on you crazy diamond. Nuff said. Strike 2. The Swine Flu, sorry, Mexican Flu was hyped. According to the CDC, 36,000 people DIE each year from the influenza related complications – you know, the type you are suppose to get a vaccine for each year. As of the writing of this post approximately 45 people have died from the Mexican Flu. Now, any fatalities are horrible, but how about a little perspective on the matter. I’m just sayin’….. Strike 3. Yes, the worst terrorist attack in our history was perpetrated by a foreign conspiracy. But the second worst, the Oklahoma City bombing, was perpetrated by an all-American lunatic. Politicians and media organizations wind up such people at their, and our, peril. That’s his big finish. Kind of a fizzle, really. These people don’t care what some commentator on the TV or radio says. If McVeigh was really a lunatic then that kind of stuff wouldn’t matter anyway, but maybe I’m just blowing smoke up your backside. At least Mr. Krugman is honest and upfront about his feelings. It would be nice if more journalists were that transparent. Now, I’m a Pro-Life from conception kind of guy. We can argue back and forth whether life begins at conception, but in my book, the Partial-Birth Abortion procedure is extremely heinous. This procedure consists of delivering the baby, all but the head, jamming a sharp object into the skull of the infant and sucking out the brains. Pretty gruesome in my book and very unnecessary. Take out the “health of the mother” cases, which I have my doubts there are many of those that require this procedure, but I’m sure someone will “enlighten” me on the subject. From the news accounts I have read there were only two doctors that performed this type of procedure in the United States. I guess that is somewhat comforting. NPR actually presented a pretty good overview of this procedure. The gentleman that has been picked up for this crime sounds a little unstable. Anyone that promotes the killing of an abortion doctor has to be a little unstable. The Pro-Life position would be inconsistent if it promoted such behavior. Every major Pro-Life group has denounced this action as the always do when this type of thing occurs, but there are always a couple of kooks out there that get the ear of the news media. Funny though, I don’t see the same interest in the babies that Mr. Tiller has killed over the years, but what do I know? Attention: this video depicts drawings of the Partial Birth Abortion procedure. We live in a society that puts very little on the price of a human life but we’ll go to the ends of the earth to prosecute anyone that hurts an animal. I’m not condoning cruelty to animals, but how much coverage did Michael Vick get for beating and killing dogs? More than the case deserved in my book. Dr. Tiller: Hello St. Peter, I’m Dr. George Tiller. Can I enter the Pearly Gates? St. Peter: Well Dr. Tiller, as Dr. Evil would say, “How about Nooo”.